The Essential XlsIO provides rows and columns manipulation options equivalent to Excel such as insertion, deletion, hiding, adjusting dimensions, grouping, sub-totaling and more through IWorksheet interface. 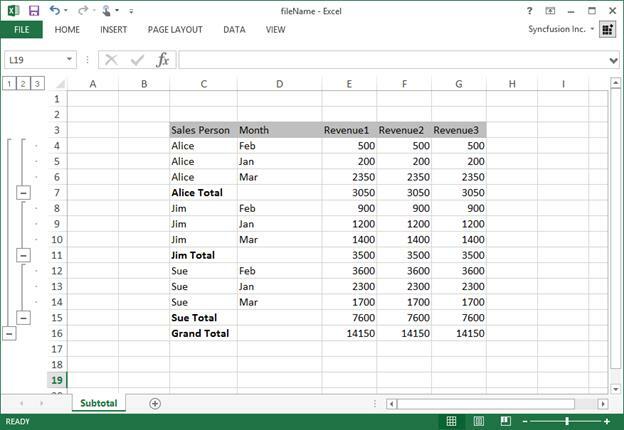 The following code snippet illustrates how to insert rows and columns in a worksheet. //The operation in SaveAndView under Xamarin varies between Windows Phone, Android and iOS platforms. Please refer xlsio/xamarin section for respective code samples. Row and Column index of Insert methods are “one based”. To know more about insert rows and columns, refer to the WorksheetImpl in API section. The following code shows how to delete rows and columns. //XlsIO supports DataProviderType of IApplication in Windows Forms, WPF and UWP platforms alone. In addition, cells can be deleted by shifting other cells in a row or column towards up/left by one step. This can be done by using the Clear method as shown in the following code. Deletion by using above method is more efficient than looping. Row/Column index of these methods are “one based”. Visibility of rows and columns can be set by using the ShowRow and ShowColumn methods as shown as follows. The Essential XlsIO allows to set visibility for a specific range. The following code snippet shows how to set the visibility of a range. Resetting column width manually or through AutoFit, for the columns hidden using ShowColumn/HideColumn methods will make the hidden columns visible. Resetting row height manually or through AutoFit, for the rows hidden using ShowRow /HideRow methods will make the hidden rows visible. A single row or column can be resized by the SetRowHeight and SetColumnWidth methods of IWorksheet. Similarly, the height and width of a single row or column can be accessed using the GetRowHeight or GetColumnWidth methods of IWorksheet. The following code snippet shows how to resize a single row and column. Multiple rows or columns can be resized and accessed by using the RowHeight and ColumnWidth properties of IRange. The following code snippet shows how to resize multiple rows and columns. If a column width or a row height is 0, then the column or row is hidden. Column width and row height can also be set in pixels, by using the IWorksheet.SetColumnWidthInPixel and IWorksheet.SetRowHeightInPixel methods respectively. The XlsIO allows to auto-size the width and height of a cell to fit its content. This section demonstrates various methods to auto-fit rows and columns of a worksheet. The following code snippet shows how a row and a column is re-sized to its content. worksheet.Range("A1").Text = "This is a long text"
worksheet.Range("A3").Text = "This is a long text"
Row and Column indexes are “one based”. There is an alternative way to auto-fit row or column is by accessing the row or column, which is shown in the following code snippet. Here column and row indexes are “zero based”. Multiple rows or columns can be auto fitted based on the range specified. This is depicted in the following code. worksheet.Range("A1:D1").Text = "This is the Long Text"
worksheet.Range("A2:A5").Text = "This is the Long Text using AutoFit Columns and Rows"
1) If a Range is text wrapped, the AutoFitColumn method will not be applied on it. 2) If a Range is merged, the Auto-Fit methods will not be applied on it. Note that this is the behavior of Excel as well. 3) Auto fitting is a time consuming process so, it might cause performance issues when used excessively. Rows and columns can be grouped or ungrouped to summarize the data, which is given in the following code snippet. Groups can be expanded and collapsed using the ExpandGroups and CollapseGroups methods of IRange, which is given in the following code snippet. The XlsIO supports subtotaling a group to quickly calculate rows of related data by inserting subtotals and totals. Various Subtotal options like Summary below data, Replace current subtotals, Page break between groups can be used to customize data. The following code shows how to add subtotal for a given range. The screenshot of the output with SubTotal generated from the previous code. Summary of a group can be shown above the rows and left of the column using the IsSummaryRowBelow and IsSummaryColumnRight properties of IPageSetup interface. By default, these properties are set to TRUE.